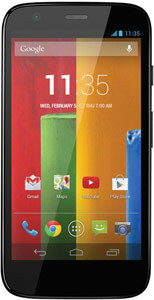 Motorola Moto G – DVX/XT1032, the latest and cheapest smartphone announced from Google. This smartphone is coming in 8GB and 16GB internal memory option. Will be available worldwide soon with a cheap price tag. Google just announced the phone and various retailers started taking pre-orders. Moto G is a Google Android phone with 4.5″ 720p TFT LCD display, Qualcomm Snapdragon 400 1.2 GHz processor, 1GB RAM. Comes with a 5MP back camera and a 1.3MP front facing secondary camera for video call and a whopping 2,070 mAh battery. Well, Moto G is coming with a non-removable battery and no option to extend the storage. Like recently released Nexus 5 and other Google Nexus phones. Will be available in few different colors. There are plenty option to buy the Moto G from online and instore retailers from high street stores. Amazon UK has priced the Moto G 8GB for £135.00, which is 10% off to its normal price. They are taking pre-order for the 16 GB version for £159.99. This item is sold and dispatched by Amazon itself, no marketplace seller or 3rd party at the moment. This smartphone is going to be for the masses. Google planned to deliver the phone nearly every corner of the world. Amazon UK now taking pre-orders only with the price guaranteed. You don’t need to spend extra money to get it delivered to your home, as it comes with free home delivery. You will be able to use the phone with any UK mobile network. Moto G is set to release with Android 4.3 Jelly Bean with planned upgrade to Android 4.4 KitKat. Will you be getting a Moto G? Does the price and specs looks tempting to you? Let us know in the comment or in our Facebook page. This is not the phone for you if you are planning to use 4G network. This phone is coming unlocked. However, if you buy a SIM locked Moto G and want to unlock, it is possible for only £2. Yes, you can unlock Moto G for only £2. You can also root your Moto G to unleash its power and control.